I live in one of the most desirable areas for fishing, yet don’t take advantage it. My fishing experience is limited to fishing with my dad, siblings, and grandfather in Detroit. Obviously, Detroit doesn’t have the same fishing-related reputation as Montana. We fished off a boat dock on the shore of the Detroit River just before it opened up into Lake Erie. We caught carp, mostly, and an occasional sunfish or catfish. We sometimes kept and cooked the catfish, but the carp were all thrown back. We just did it for fun. Despite my family’s own limited Detroit River fishing, that area actually offers a lot in the way of water recreation. Lake Erie, Lake St. Clair and Lake Huron are all within an hour’s drive of downtown Detroit. But once I grew up and stopped fishing with my family, I never went fishing again. It just wasn’t something that appealed to me. I love the water, I love being out in nature, but I don’t need to fish to enjoy it. Montana has always been a mecca for people who love fly fishing. Fly fishing’s popularity increased even more with the release of the 1992 movie A River Runs Through It, starring Brad Bitt and filmed near Bozeman, Montana, a town just a 90 minute drive away from where I now live. The movie contains beautiful scenery along with poetic dialog and narration extolling the virtues of fly fishing, likening it to a near-spiritual experience. 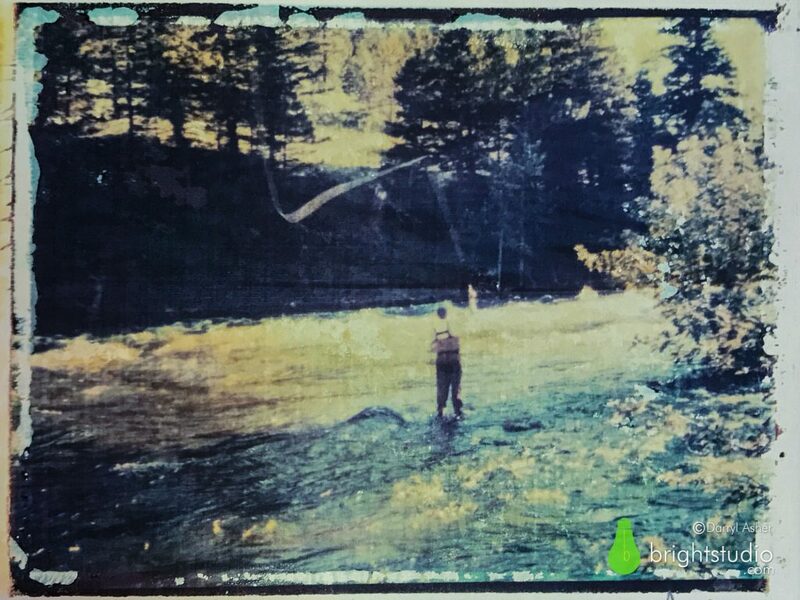 This photograph, one in a series of three, was taken when I went on a fly fishing trip with some friends. They were going to fish, and I was going to hike and take photos. Watching my friend Eric wading through the rushing waters, I can tell you the beauty and poetry of the sport is not overstated. It’s incredibly calming, even just to watch. The sound of the water, the wind through the trees, the fishing line cutting through the air, and the whiplash of the rod combine to make the experience nearly hypnotic. You can understand the appeal. I wanted to capture the feeling of solitude within nature with these photos. I shot this series on Ektachrome slide film, using my Olympus IS-1 camera, and created Polaroid transfer images by exposing the slides to Polaroid pack film, and transferring the emulsion to linen finished printers paper. This gives the image an aged and timeless look, which I think is appropriate for the subject matter. Available as a 13 x 19 inch archival museum quality print.